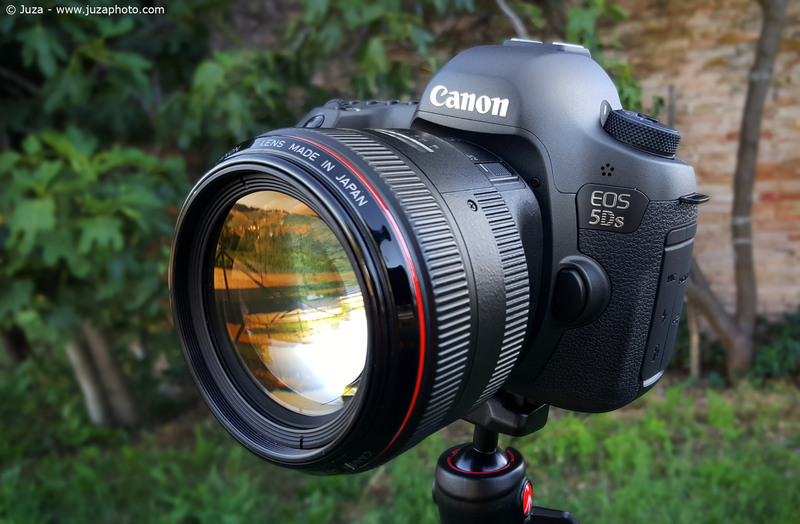 Canon 5Ds review, text and photos by Juza. Published on June 30, 2015; 1 replies, 17524 views. The Canon 5Ds is the new 'megapixel monster' on the market: at 50 megapixel, it has more than twice the resolution of all other Canon cameras, and it is well beyond even the Nikon D810. The only thing bigger than its pixel count is the number of discussions that it has created: 50 MP does make sense? Are they a marketing gimmick or they are truly useful? Of course, I was very curios to find out, so I tried it as soon as it reached the market. This time, I'll skip the description of the camera body, built quality and features, for a simple reason: this is essentially a Canon 5D Mark III with a 50 megapixel sensor. The body, the viewfinder, even the buttons are exatly the same of the familiar 5D3, so if you are used to the Canon 5D line you will feel at home. Even the menus and the autofocus are very similar: this is a good news, because the 5D3 has a pretty good AF that makes it suitable for action and wildlife, and the 5Ds shares the same AF module plus an improved iTr (intelligent tracking). The 5Ds is just an hair slower at 5 FPS (vs. the 6 FPS of the Canon 5D3), an impressive feat considering that it has more than twice the pixel count. The big news of the 5Ds is without doubts is 50 megapixels sensor, so I have tested it to evaluate every aspect of image quality: resolution, high ISO and dynamic range. At 50 megapixels, the Canon 5Ds is the new resolution king, but how big is its advantage? and is it truly noticeable in real world? I have compared it with the 5D3, and I have taken several photos at different apertures, from f/4 to f/22. Indeed, a super sharp lens is not enough to take advantage of the big megapixel sensor: you must shoot only at certain apertures, otherwise the diffraction will kill the detail, and you won't get the full resolution of the sensor. 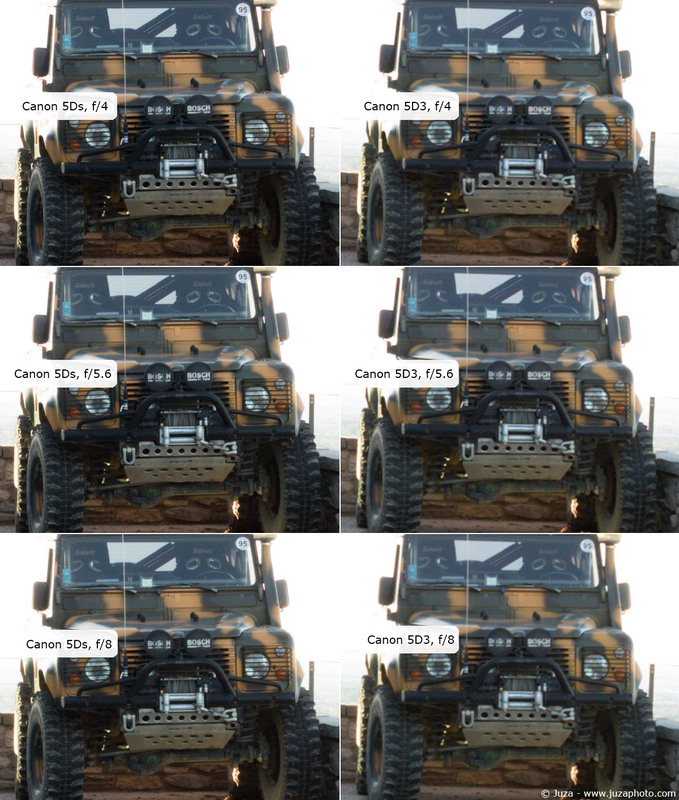 The following images are 100% crops, the files of the 5D3 have been enlarged to 50 megapixel for comparison with the 5Ds. From f/4 to f/8 the effects of diffraction are negligible, and as expected the 5Ds kills the 5D3 - it really captures a lot more detail. Of course, for these test photos I have used a very sharp lens, the Canon 24-70mm f/2.8 L II. The diffraction becomes visible at f/11 and it is a serious problem at f/16 and f/22. Stopping down reduces a lot the resolution advantage of the 5Ds; at f/22 it is just an hair better than the 22 megapixels Canon 5D3, while at f/16 and f/11 the 5Ds has a more clear advantage, even though it can not use the full resolution of the sensor due to the loss of detail and contrast caused by diffraction. 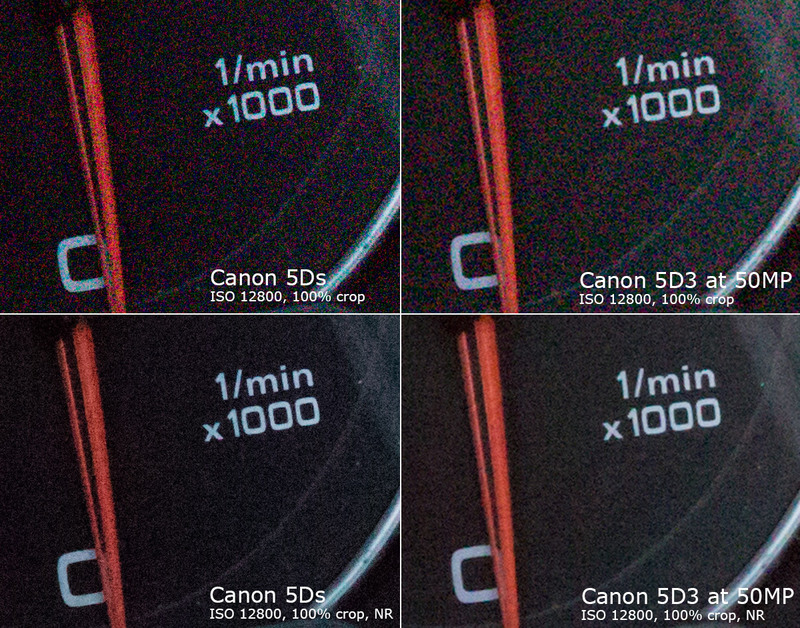 The 5Ds has about the same pixel size of current APS-C cameras, that are not known for stellar high ISO performance. How does it compare with the 5D3? I have taken a test photo at ISO 12800 - the maximum fully usable sensitivity on current fullframe cameras - and I have compared the results with and without noise reduction. 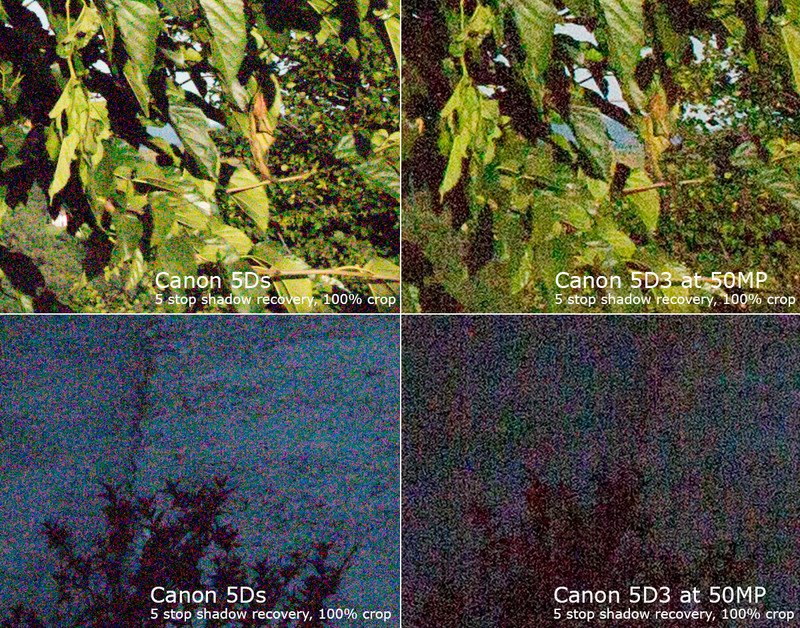 The results are better than expected - when compared at the same size, the images taken with the 5Ds shows essentially the same amount of noise of the 5D3, but the noise is more fine-granulated and the detail is slightly better. 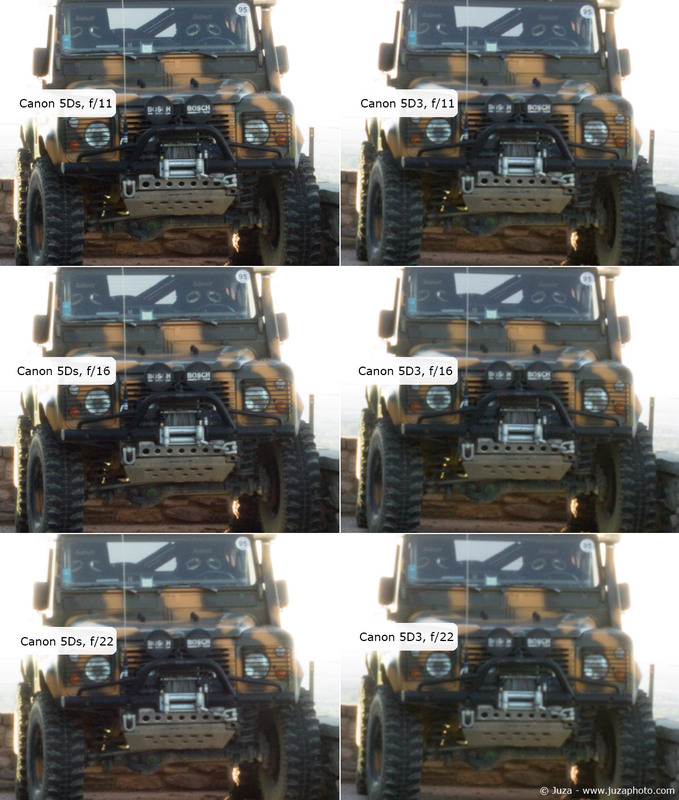 To get this result you have to watch the two images at the same resolution; if you look at 100% crops from the original photos the 5Ds has more noise, but in real world the are equivalent. Of course there are better cameras in terms of high ISO : the Canon 1DX, Canon 6D, Nikon D750, Nikon D4s or Sony A7s have better high ISO quality, but overall the 5Ds gives a pretty good result considering its huge pixel count. 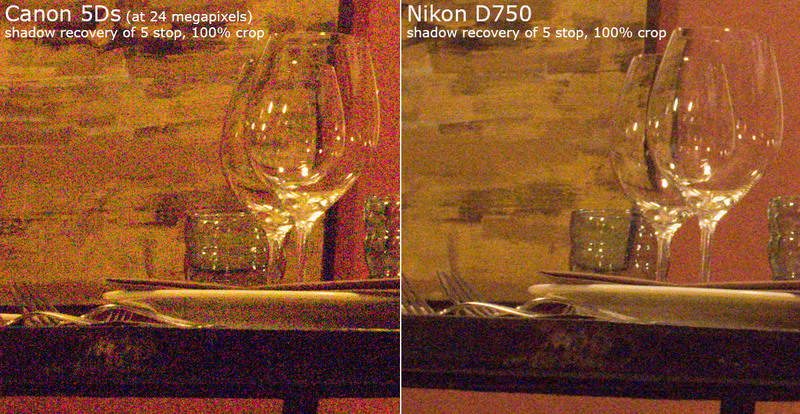 In the latest years dynamic range has been the Achille's heel of Canon sensors; here I have compared the 5Ds with the Nikon D750, with a big (+5 stop) shadow recovery at ISO 400. Even though it does not match yet the Sony sensors, Canon has improved a lot its latest FF cameras; the 5Ds is miles ahead of the 5D3 in terms of shadow recovery/dynamic range. I have spent several mornings in the field, at sunrise, to take macro photos with the 5Ds. This camera can deliver outstanding image quality, but it is really hard to use for macros: first, if you want to take advantag of the full resolution of the sensor you can not stop down to apertures smaller than f/8, so you have to work with a paper-thin depth of field. Getting the entire subject in focus is possible only with very flat subjects (e.g. butterflies) and it takes an immense amount of patience. The second difficulty is that the 5Ds does not have tiltable LCD screen... madness! Canon has one of the best tiltable screens (the LCD of the Canon 70D can be tilted in every direction, while my Sony A5100 screen can only be tilted upwards) and the best touchscreen (the LCD of the 70D has an excellent multi-touch, as smartphone's screen, while the Sony A5100 has a very poor single-touch screen)...but no Canon FF camera benefit from this awesome technology. Canon 5Ds, Sigma 105mm f/2.8 Macro DG OS HSM, 1/3 f/8.0, ISO 100, tripod (download at full res). Canon 5Ds, Sigma 105mm f/2.8 Macro DG OS HSM, 1/5 f/8.0, ISO 100, tripod (download at full res). After the macro photos, I have visited the small medieval village of Castell'Arquato for tests with landscape/architecture subjects. I have used the sharpest standard zoom currently available for Canon, the Canon 24-70 f/2.8 L II, that proved to be excellent in the center, but not perfect in the corners, on the 50 MP sensor. Landscape photography with the 5Ds is a lot easier than macro, but you still have to pay attention to careful focus and to the limited depth of field, since the smallest aperture that delivers the full 50 MP of detail is f/8. Anyway, even at f/8 the depth of field is acceptable, if you don't have anything very close to the camera. I have taken a test photo at ISO 6400, too: of course noise is here, but after some noise reduction the photo is fully usable, and if you resize it to 22 MP it is on par with the Canon 5D Mark III. Canon 5Ds, Canon EF 24-70mm f/2.8 L USM II at 70mm, 1/80 f/8.0, ISO 100, tripod (download at full res). Canon 5Ds, Canon EF 24-70mm f/2.8 L USM II at 24mm, 1/60 f/8.0, ISO 100, tripod (download at full res). Canon 5Ds, Canon EF 24-70mm f/2.8 L USM II at 24mm, 1/30 f/8.0, ISO 6400, tripod (download at full res). A final note about post processing: each RAW file takes from 50 to 80 megabytes, and the post-processed, 16 bit TIFF files takes...280 megabytes per photo! With just four photos you will fill up one GB of space, so you may need some extra disk for storage. 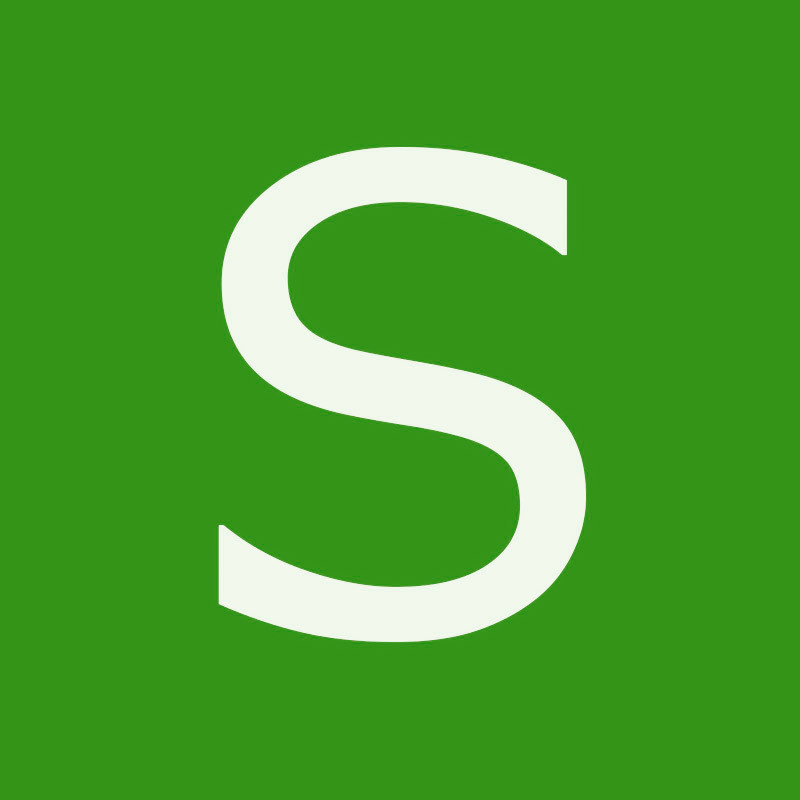 Post processing speed depends by your computer, and it essentially takes twice the time needed to post process a 20/25 megapixels file. Conclusion: who is it for? You may think that 'big megapixel' cameras are for studio and landscape, but the aswer is not that strainghtforward. Let's begin from Landscape: in ideal conditions the 5Ds will do wonders, but you need exceptionally sharp lenses (even the Canon 24-70 f/2.8 L II is not perfect in the corners) and you are limited to f/8, so it will be fine when you don't have anything in the close foreground, but not that great when instead you need a lot of depth of field. Honestly, for landscapes I'd get the Canon 6D, because in this field I often use apertures like f/16, where the diffraction kills much of the advantage of the 50 megapixels sensor. The Canon 6D is a lot less expensive and it has slightly better high ISO, too. Birds, action, sport and wildlife? These photographic genres may not seem suitable for this camera, but I think that it works quite well here. The old Canon 5D Mark III has been often used in these fields (with good results), and the 5Ds has everything the 5D3 had, plus a 50 mp sensor. In these fields you will often use professional tele lens (very sharp) and you will often shoot at wide apertures, where diffraction is not a problem. With the 5Ds, you will get an immense amount of detail and the possibility to make huge crops without losing image quality so... yes, I think that it can be a good wildlife/action camera, if you compare it with the 5D3 (of course the 1DX is the king in this field, but that's another class of cameras). What about macro and still life? Well, sometimes you will get great results with the 5Ds, and the macro photos at 50 MP are a joy for the eyes, but... you are limited to shoot at f/8 if you want to get the best from the sensor, while macro phography often requires f/11 or f/16. Overall, if I had to choose a camera for macro photo I'd go for a much cheaper APS-C camera. The 5Ds will give awesome results in portrait, fashion and wedding photography. In these fields, high quality lenses combined with wide apertures (diffraction stay away!) will deliver an impressive amount of detail, with photos that rivals the image quality of medium format cameras. Again, remember that you need extremely sharp lenses if you want to squeeze out every bit of resolution from the 5Ds sensor. For street, photo-journalism and reportage, the result will vary depending by the light and shutter speed; you may get very good results, but you need a fast shutter speed to avoid motion blur (remember that the blur is more visible with small pixels). The Canon 5Ds is not a reflex for every photographer and for all fields, but in the right genres and with some attention it can give and exceptional quality: more resolution than any other FF camera currently on the market, better dynamic range than other Canon cameras and the same noise of Canon 5D Mark III.